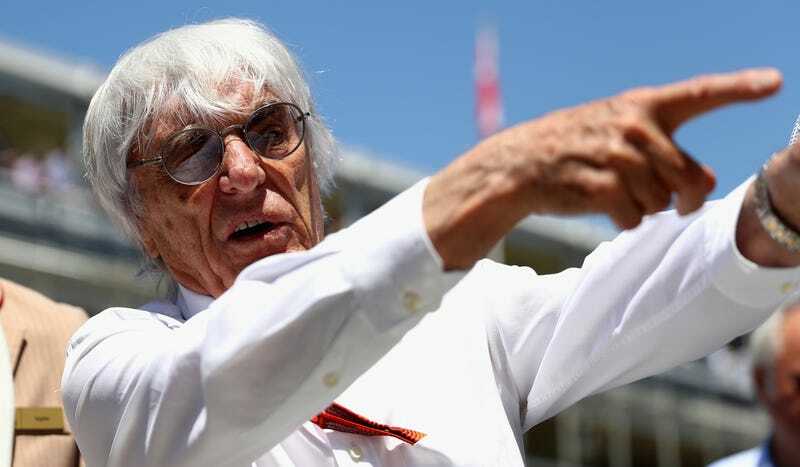 If you hoped that the sale of Formula One would mean that troll-king Bernie Ecclestone would retire to the bridge from whence he came to a nice life of bribing the Billy Goats Gruff, I’ve got some bad news. Ecclestone will remain the chief executive officer of F1, per Autosport, sharing duties with a new chairman. Fortunately, Ecclestone will be working closely with some fresh blood to the sport: 21st Century Fox chairman Chase Carey, who will become F1's chairman. The deal still needs to be signed off by several other stakeholders before it becomes official, but regardless, Eccelstone is certain he’s sticking around. I will continue to do all the things I have previously done, such as negotiate with the circuits, television companies and people like that. The good news is we will have someone on board in Chase [Carey], and he will hopefully be able to push F1 into new territories with social media. As you know I’ve never found a way to make money from social media. F1's relationship with online media is among the worst, so as long as Carey and the rest are allowed to do their jobs, hopefully it will improve. Chase ran DirecTV in America, and we’re weak in America, so I hope upon hope that having him on board will help in that respect. America! As a place to grow! That F1 wants growth in! Well, at least Bernie’s $till predictable. Maybe the new social media overlords will know when to cut his mic. Own A Large Stake In Formula One For Just $8.55 Billion!